Discussion in 'Football Forum' started by Utdfrom2002, Feb 10, 2018. Some good games this weekend for a change. 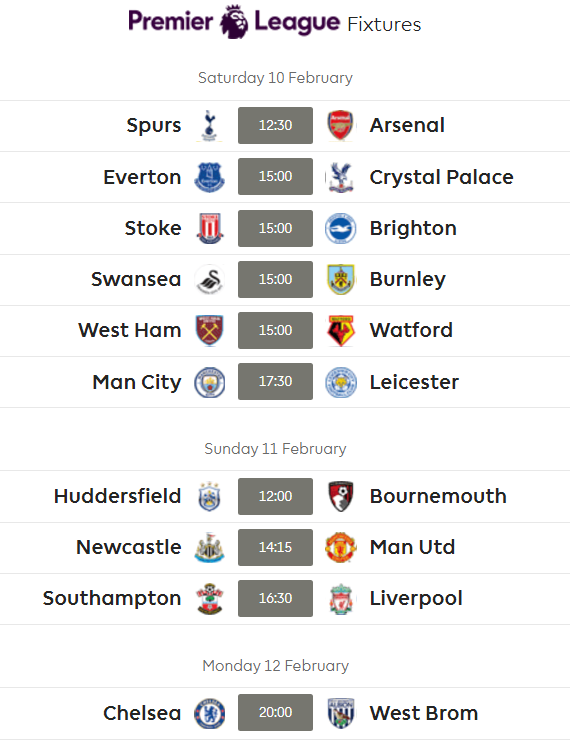 Hoping for Arsenal, Soton, Leicester and west brom wins. And United of course! Also, why are Chelsea playing on Monday again?! So, after the brilliant set of results last week, would it be too much to hope for more of the same? Really hoping for an Arsenal win at Spurs, draw at worst. 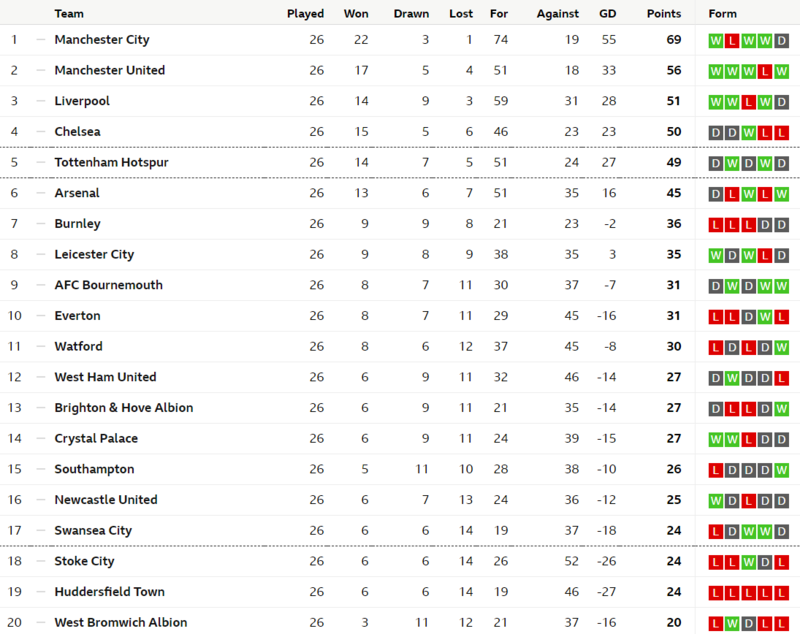 Combine that with a win at Southampton and we could be looking at a 5 point gap to Spurs. This is the 3rd time we've had an opportunity to do it (banking on other results too of course) so let's hope it's 3rd time lucky. I think we can edge Southampton 1-2. Should be comfortable wins for Chelsea, City and United though there's always hope that El Rafa can pull something off. There is zero chance Newcastle will remain unbeaten against Utd. They might not be relegation strugglers but they are an awful team and Utd don't possess a Mignolet, Lovren or a Moreno to change the inevitable. Nice attempt at a jinx. Newcastle raise their games when they play us. Don't know what to think about today's game. Its an away game, but Arsenal have a great record at Wembley, won 9 out of the 11 matches we played there. Also the fact that its a derby would mean that form goes out the window. This match should set the expectations for the rest of the season. Win, and we can see arsenal going on a run. Lose, and its the same old, same old. Expect Liverpool to drop points at Southampton(score draw) and Utd, Chelsea, City to have victories with varying degrees of comfort. Fancy Southampton to get at least a point against Liverpool. Have you ever dropped points to them under Jose? Mourinho actually has a pretty terrible record at Newcastle from his Chelsea days. Fancy Spurs to win by 2 goals against Arsenal. Keown dressed as a Bond Villain. A draw in the North London derby would be great. Have a go at them since the start and press them to death, not be shy. C'mon Arsenal! Sadly so do I. Written in the stars. We took most of their players, they're in a relegation scrap and need the points. Almost inevitable. As for Spurs and Arsenal, a draw would be nice. 'Cos Mondays always provides the blues. Defensive lineup from Wenger. Not like him. Will be a lot of pressure of Mkhi and Ozil to bring them forward and create. Not much pace other than Auba. Expecting Ozil and Mkhitaryan to do some defensive work? So what formation will arsenal put out with those players? 4-3-3 with Mkhi and Ozil wide forwards? Why is Kolasinac on the bench for Arsenal? Will Mkhi turn up in a big game or is he going to disappear as per usual? He can't play as badly as he did vs Liverpool and Chelsea that's for sure. If he at least puts in some effort today it'll be better than his performances against Liverpool and especially Chelsea this season for Utd. Surprising that Alderweireld is not even on the bench, seeing as he played mid-week. Perhaps Poch is easing him back in slowly and saving him for Juve - I hope so. How’s Lacazette doing for Arsenal? Wasn’t he their record signing. Done okay. It’s clear that Wenger doesn’t rate him though. Fantastic, one great game and it is new beggining for Arsenal. Those people in BT studio are joke. What’s happening with Kolasinac? People were raving about him at the start of the season. Eh? Keown was the only one really saying anything positive about Arsenal. It's just Martin Keown trying to peddle that nonsense isn't it? Rio seems pretty realistic about it all. Their defence and midfield is still no where near good enough. I think everyone is a bit scared of Keown. Spurs to demolish Arsenal today, IMO. Well he is an ugly blighter. You only have to look at AFTV post-match reviews to realise it's the entire fanbase. Why do you think Wenger has lasted so long? Arsenal fans have impressive reserves of optimism and short-term memories. Hope Arsenal win, but can't see it. Mkhitaryan will show his true colours tonight. That midfield and defense of Arsenal is an absolute abomination, no amount of Aubas is going to change this fact. Spurs will have only themselves to blame if they don’t put them away.